(Newser) – A little over a month after New York Gov. 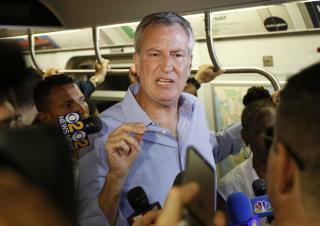 Andrew Cuomo declared a state of emergency for the New York City subway, his longtime nemesis in the city, Mayor Bill de Blasio, is proposing a new tax on wealthy New Yorkers to help fix the ailing system. On Monday, de Blasio will announce what the New York Times refers to as a "millionaires tax" to help repair the deteriorating system, which is plagued by delays, mechanical issues, and even derailments, the AP reports. The tax would also subsidize reduced fares for low-income riders. The tax would bump the top income rate from 3.9% to 4.4% for couples who make more than $1 million per year and individuals who make more than $500,000. It would affect just under 1% of people filing taxes in the city. That's the knee-jerk reaction of any politician: more taxes. How about being efficient with the exorbitant amount of taxes they demand now? Average worker pays about 33% of gross income in taxes. Plus property taxes, vehicle taxes, sales tax, etc. We're taxed when we earn money. We're taxed when we spend money. We're taxes when we save money. How about no new taxes. As usual poor conservatives bristle with hate over the idea. They would starve their families and die to keep a rich man getting richer. How can reason with such people? If NYC taxed every millionaire at a 100% tax rate, it still wouldn't keep the subway running, because they can leave. The Nazis had the Jews. The Left has the 1%. Got to blame someone for the failures of socialism.